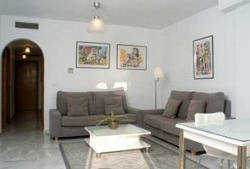 The Poniente and Levante (ref 3610)apartments at Alvarito Playa make a great holiday base for the whole family. 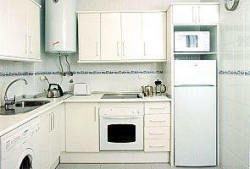 Rent these units separately or together for larger parties. Both offer flexible accommodation options including babies cot and kiddies fold down bed. 5 minutes drive from Marbella. These modern ground-floor apartments have direct access to miles of safe sandy beaches with lots of great bars and restaurants to laze away the days! The properties are set in lush gardens with three swimming pools. Forget the car! 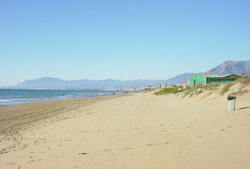 You can walk straight onto the beach and tennis courts with local shops a moments walk away. With air con/heating and modern furnishings throughout each unit comprises two twin/double bedrooms, two bathrooms with a spacious lounge and dining area. Enjoy cooking in the fully equipped kitchen or dine al fresco dining on the private terrace overlooking the beautiful communal gardens. A weekly change of bed linen and bath-towels. Complimentary beach towels provided.